The iconic TaylorMade Burner franchise has introduced a new weapon, packed with speed featuring the most aerodynamic, innovative and largest Speed Pocket ever produced in a TaylorMade driver. 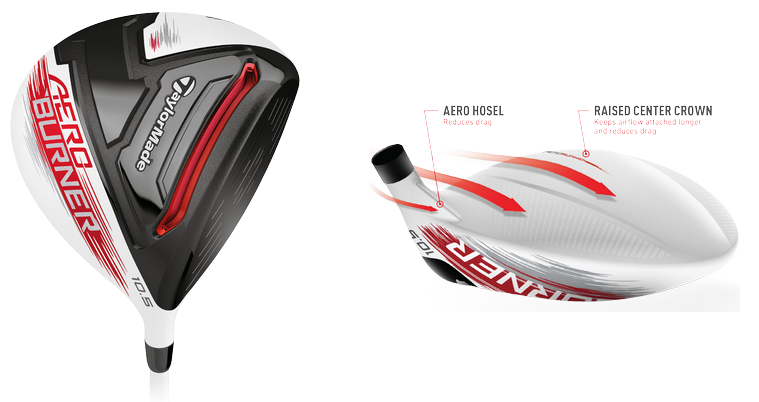 The TaylorMade AeroBurner driver name is derived from the new, advanced aerodynamic design of the driver. TaylorMade has added three new features to help achieve this aerodynamic design. A Raised Crown Height with a Rounded Toe – reducing drag to increase swing speed and gain more distance. The Speed Pocket is larger than ever and creates more consistent ball speeds across the face, especially on off-center hits. The Speed Pocket can cover more of the sole (toe to heel) because TaylorMade has removed the Loft Sleeve from this driver. TaylorMade’s Burner franchise has been greatly enhanced and we suggest you take a look! Additionally, see what we have to say about the TaylorMade JetSpeed driver, another driver that’s all about speed!